One of the greatest achievements in life is the proper maintenance of health. Now-a-days, it has become too tough to maintain proper health.The disease or infection that is caused most often is related to nose, ears and eyes such as- flu, cold, cough, eye pain, etc. Especially for children, ear pain bothers a lot and most people rush to the specialists for fast relief. But, it becomes difficult to consult doctors, when ear pain bothers in the midnight or other unexpected periods.During such crucial times, it is always a good practice to know the quick home remedies for ear infection which definitely gives good relief. Most commonly used treatment for curing ear pain is the garlic. Take coconut oil in a small pan, throw crushed garlic into the oil and keep it on a low flame till it becomes lukewarm.Now, dip the ear dropper inside the lukewarm oil and put 2-3 drops inside the ears for better relief. You can use mustard oil, groundnut oil, tea leaf oil, olive oil, etc. But, it is always a great idea to use coconut oil. Doing Pranayama-inhale and exhale exercise helps a lot to cure ear problems. You can also try similar exercise – hold your nozzle tightly and exhale from nose, closing your mouth. This gives quick relief in seconds of time. Take a fresh white clean cotton cloth and dip it inside the hot water, and spin out the water. Keep the cloth on the ear for 5mins and do the same for 5 – 6 times and relax. Heat the empty pan, put a small cotton cloth ball and rub the pan, now takeout the cloth ball and put on your ears for 5- 10 minutes. Do this for atleast 3-4 times to get good relief. Try boiling, Tulsi, Neem or Tea leaves. Take water in a small pan, put either Tulsi or Neem leaves or tea leaves and boil the water. Pick the water through ear dropper, and drop 3-4 drops of water in your ears for better relaxation. This mixture of water and white vinegar, or even pouring few drops of milk into the ear, is also most effective that helps get rid of infection. Take a small slice of onion and heat on a pan. Roll a tiny cloth on the onion and keep at the edge of your ear, due to which ear pain will be reduced. You can use hair dryer to blow hot air inside your ear that pops your ear drums and relieves from pain. Chewing Gum or Cloves is the best exercise for mouth and ears. Pressure of chewing, minimizes ear pain. You can also try rubbing your hand on your ears, or put your finger deep inside the ear for few seconds, even few drops of alcohol works well to reduce infection to get better alleviation. 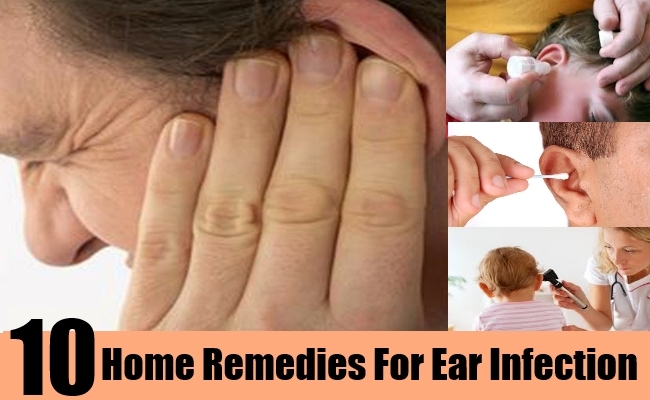 These are the few quick natural home remedies that gives you great relief from any kind of ear infection.